During catastrophic scenarios it is essential to quickly set up radiation monitoring & measuring stations. Achieving reliable wireless data allows for an efficient radiation detection & measurement. Typically public communication networks like GSM/GPRS cannot fulfill the high standard of availability requirements. 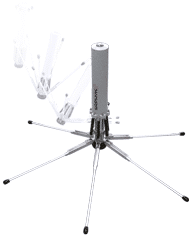 SkyLINK/ShortLINK radio or satellite solution combined with GammaTRACER probes, especially GammaTRACER Spider, are designed to operate reliably even under emergency conditions. Deployment is fast and easy: the sensors are lightweight (GammaTRACER probe: ca. 2 kg) and simple to use (set-up in minutes, no switching elements), and the receiver can be powered by a car battery. 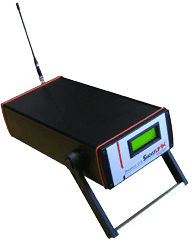 The GammaTRACER is designed for continuous measuring, recording and optionally transmitting the environmental gamma dose rate. DataEXPERT 10 is a web-based data management solution for extensive radiological monitoring networks. Our radiation monitoring systems are available with reliable and secured public or proprietary data transmission solutions.